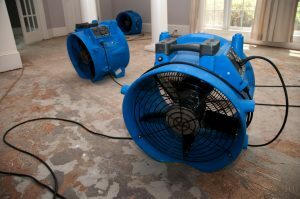 Water damage restoration is an involved process. To effectively restore water damage, only the highest quality equipment and methods should be used. Thus, it is always best to contact a professional cleaning and restoration company as soon as possible after a flood so they can bring their superior equipment and expertise to help you restore the damage done to your home. We at American Cleaning in the Claremore area are one such company here to help you with any water damage emergency. Below is information on four of the most important types of equipment that we use to restore water damage. Air movers are portable drying devices that are able to move a large volume of air near the flooded area. By doing this, they promote the fast drying wet surfaces and increase general air circulation throughout the entire home. We have air movers in several different sizes depending on the size of the job. Without professional help, most people would simply use fans which serve a similar purpose but aren’t nearly as strong or effective. Dehumidifiers are portable machines effective at removing excess moisture from the air. They are typically used for preventing mold growth. They are incredibly useful because mold growth can begin to occur within 24-48 hours after a flood. Using a dehumidifier can be the difference between completely avoiding mold damage and having a mold damage problem. Air scrubbers are designed to remove odors and other particles from the air. Typically, air scrubbers are used for fire damage restoration, where they remove smoke particles from the air. However, these tools are also effective for removing the musty smells associated with water damage and mildew presence. Wet air scrubbers have a wet filter that traps and removes airborne particulates, whereas dry scrubbers use an ionic purifier. Water pumps are used for exactly what they sound like. When there is a large amount of excess water within a home, we use water pumps to pump the water directly out of the home. This isn’t necessary when the water damage is only bad enough to cause moisture to spread throughout the home. However, where there are large amounts of standing water they are necessary to speed up the drying process. Using water pumps in cases like this is important because they minimize the amount of time that water damage is affecting your home. The longer flood water remains in your home, the greater the overall damage will be. We at American Cleaning in the Claremore area hope you never have to deal with the traumatic effects of flooding and water damage. However, if you do, we hope you don’t hesitate to call for help. Along with the best quality restoration equipment available, our team of certified restoration professionals will be able to help you recover from the water damage done to your home and restore your home back to its original pre-flood state.